Dan Bode (a friend from church) and I are going to Costa Rica on January 24 to visit national missionary Pablo Ramirez. Pablo has been a missionary with BIO for more than 20 years working with the Deaf. This will be my first opportunity to meet this faithful servant. Pray that Dan and I will be a blessing to the Ramirez family and the other people we will meet. We look forward to preaching in deaf and hearing churches as well as ministering in any way Bro. Pablo would like us to. We plan to return February 4. This is Dan’s first trip outside the US. He knows the Lord would have him serve in full-time ministry. He is unsure of exactly where or how he will serve the Lord, but he is eager to seek the Lord’s direction as he actively prepares himself for ministry. I am looking forward to the good fellowship as we serve together in Costa Rica. Thank you for your faithful support. Because of you, this trip is almost completely paid for. There is a need of only $200 which I know the Lord will supply. Deaf pastor Bizuayehu Assefa walked in the door and God instantly knitted our hearts together. It took less than 10 seconds in his presence to know that I would grow to deeply love this pastor whom I have previously known only through email. Because of your prayers and financial help I was able to meet this dear man of God as well as many other godly servants of our Lord in Ethiopia. Bro. Bizuayehu has faithfully served the Lord in deaf ministry as a pastor for more than 20 years. He is Deaf and has a passion to reach his own people. Though he has struggled with health challenges, he continues to ask the Lord for strength to continue in ministry. He was deafened many years ago by illness and recently lost an eye due to disease. Even with these obstacles I consistently heard from American missionaries and national pastors that Pastor Bizuayehu is the hardest working and best pastor in the country. 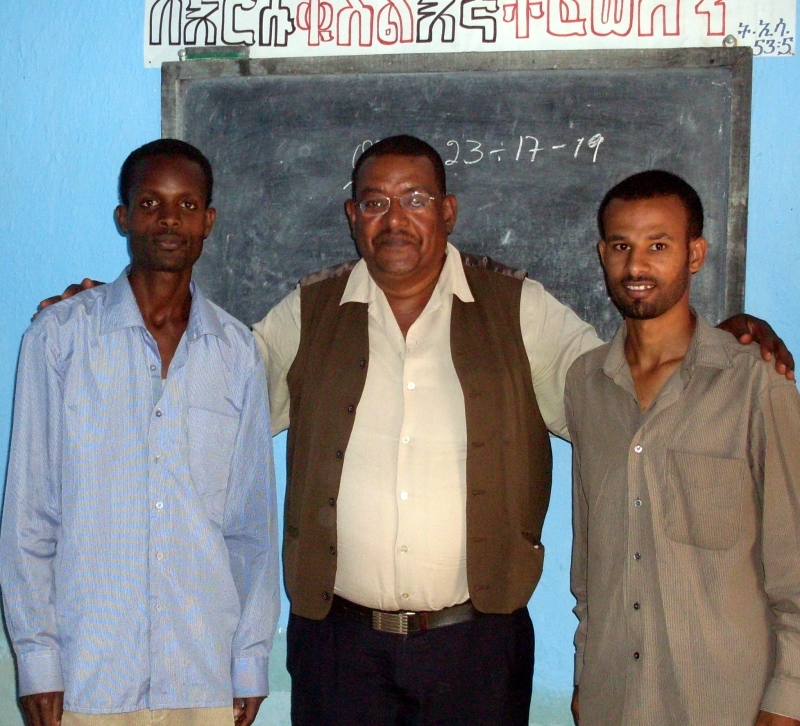 He holds a yearly conference where he is able to minister to Deaf in 16 cities and villages in Ethiopia. Pastor Bizuayehu and two pastors who work with him. While I was there I spoke 10 times in churches and Bible classes. Three precious souls accepted the Lord as Savior! One is a hearing man and two are deaf teens. All of them have been prayed for and witnessed to by Christian friends. I thank God that He allowed me to see the results of their evangelistic efforts. As far as I know, I did not eat anything too rare. I drank too much coffee. I had great fellowship. Even as busy as I was, I had time to read and pray in a way that I often don’t do here in the US. Stepping out of my daily routine helped me to see ways that I can spend more time with the Lord even back home. Thank you for your prayers and support for this important trip. There were many things I had hoped to accomplish while I was in Ethiopia. I believe I accomplished my goals. The sweetest thing is that I got to connect with people that I had never met or spent much time with before. I have many new friends for whom I can pray and know they are praying for my family and our ministry. If you are interested in helping Bro. Bizuayehu financially in his ministry, please contact BIO or me for information. He is the kind of man of integrity who will use any support he gets to further the Gospel. If he had $5 or $500 more in support each month, he could do so much more ministry. I am confident that every dollar you invest with him will be used wisely and effectively. I am planning a similar trip to Costa Rica from January 25 to February 4. I would appreciate your prayers that I can effectively minister to the missionaries there. More information about the trip will be at our website.